An important material property used in elastic analysis of pavement systems is Poisson’s ratio. 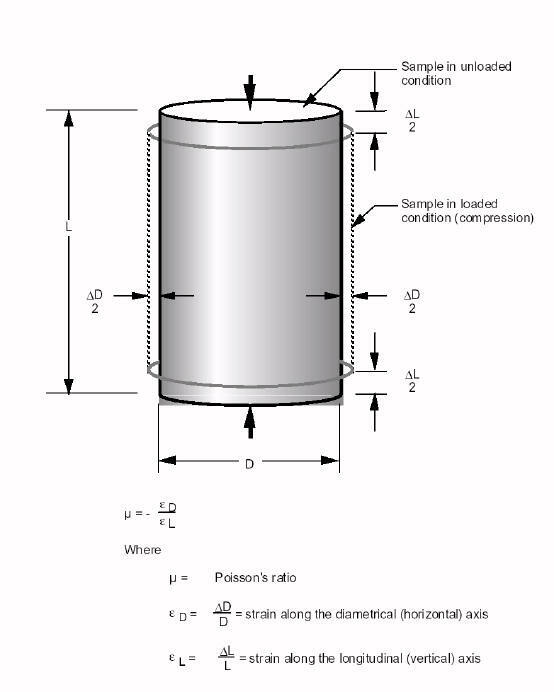 Poisson’s ratio is defined as the ratio of transverse to longitudinal strains of a loaded specimen. This concept is illustrated in Figure 1. In realistic terms, Poisson’s ratio can vary from initially 0 to about 0.5 (assuming no specimen volume change after loading). Generally, “stiffer” materials will have lower Poisson’s ratios than “softer” materials (see Table 1). You might see Poisson’s ratios larger than 0.5 reported in the literature; however, this implies that the material was stressed to cracking, experimental error, etc.